Ramblings of an Impatient Artist: Happy Halloween! Well, it's Halloween today - Trick-or-Treat is supposed to be tonight, but I don't know. They're calling for rain, storms and nasty winds. Bummer, maybe it will just be post-poned. Ya know what's not post-poned? Dare To Be Sassy Thursday!!!!! I used C1, BV000, BV01, BV02 for the skin tones, her dress is C5, C7, C9, her lips are BV08 and her hair is B24, C7 and C9. The print paper is by We R Memory Keepers. There's actually a hand poking up out of the ground there my the grave stone....The "Wicked Halloween" sentiment is by Close To My Heart. 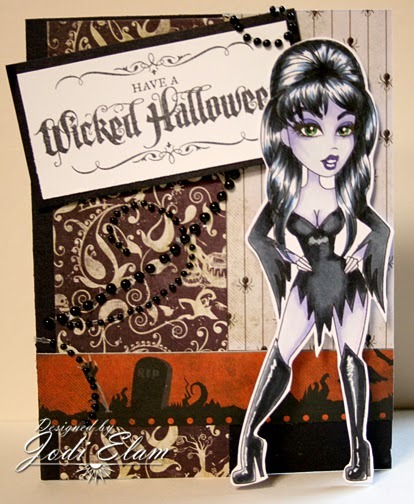 Make sure you stop by the Sassy Studio Designs blog and enter your own creations as well as check out the inspiring Halloween designs created by the rest of the team. I love this card. It is really great. This is gorgeous!!! I love it! I love you kept her black and white.. Fantastic! !